More than 80 flights in and out of Bristol International Airport have been cancelled or diverted in a row over runway safety. Easyjet would not fly in or out after raising concerns about its planes skidding when landing in wet weather. But Andrew Skipp, managing director of the airport, said the runway had been given a "clean bill of health" by the Civil Aviation Authority (CAA). He said safety was paramount and insisted the airport would remain open. All Easyjet, Aer Lingus, XL Airways, Thomson and BA flights in and out of the airport were cancelled or diverted by late Friday afternoon. Around 7,000 Easyjet passengers were affected, and 500 BA passengers were bussed elsewhere. All BA Connect flights to and from the airport have also been cancelled over the weekend. Easyjet spokesman Toby Nicol said safety was the company's first priority: "The airport has been laying a new runway and what they have not had a chance to do is cut grooves into the surface. "We have found that this is having an effect on braking distances on the runway in wet weather." In October, the airport announced a £17m resurfacing scheme scheduled to last five months. Mr Skipp said: "We would never operate an unsafe runway. We invited the CAA down to make sure we were doing everything correctly and we were. "It is the airlines' decision whether or not they choose to fly. We need to find out what Easyjet's concerns are and resolve them. "Easyjet have taken the decision that they don't want to fly and we don't criticise that decision - passenger safety is paramount. "We are in discussions with Easyjet and have been all day but I don't want them to come back until they are ready to come back." 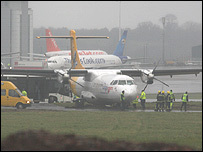 But one pilot, speaking to BBC News anonymously, said the situation at the airport had been known of for some time. "I've landed in wet weather, put the brakes on and come to the bit that is being re-surfaced, and just skated across it - we actually speeded up. When it is wet, you have no grip." Ten planes were diverted to Cardiff Airport on 30 December after three aircraft took longer than normal to stop at Bristol, it has emerged. In December, a plane operated by Guernsey airline Aurigny, with 52 passengers on board, ended up at the side of the runway, about two thirds along, after landing at Bristol. And an Easyjet flight from Malaga has also recently strayed on to the safety area at Bristol while taxiing. Easyjet says around two-thirds of its Bristol flights on Saturday will be running from Cardiff, with passengers advised to check in at Bristol before being bussed to Cardiff. Customers are entitled to a refund or a free transfer on to another flight within the next month, the company has said. A BA spokeswoman has said it would not operate flights if the runway moisture levels were above a certain level. Bristol Airport's operations director, Paul Davies, said: "Easyjet's decision is based on a number of factors including information passed to the airline by the airport on the condition of the runway surface. "Their decision to temporarily suspend flights in wet conditions is based on operational conditions within which its aircraft can operate. "Information on the status of the runway is regularly passed to all airlines as part of the airport's standard operational procedures." The Easyjet spokesman added: "The runway conditions are slick at present and we are not confident we can land our aircraft in wet weather without skidding."